This was it, then, The Beatles' very first album, and, while very much of its time, there is still some superb stuff on it. Take "I Saw Her Standing There". What and opening to a career, with its rocking McCartney vocal and solid bass line. 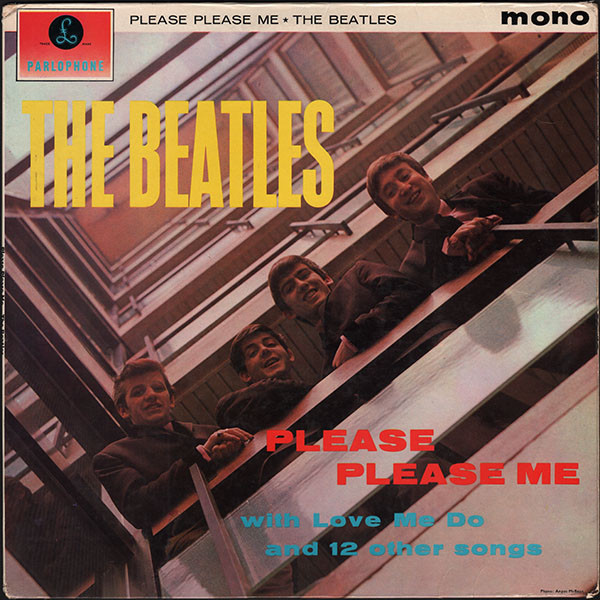 Then there is the wonderful title track, with McCartney and Lennon in perfect harmony and that iconic harmonica riff. There are six cover versions alongside the Lennon-McCartney originals but that was pretty par for the course in 1963. 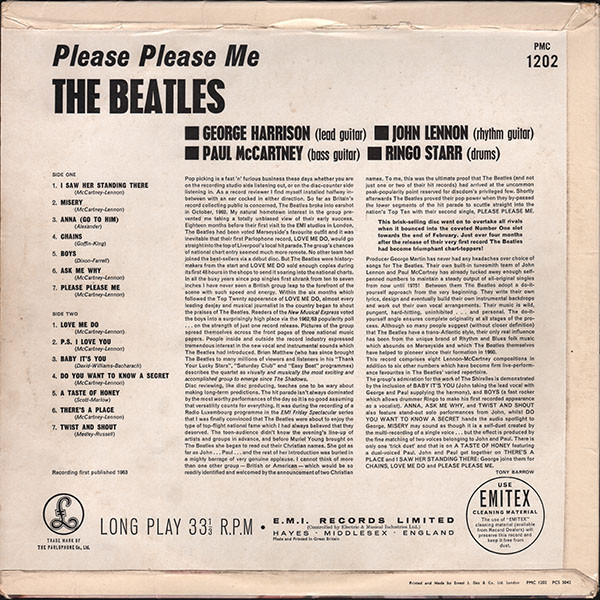 "Misery" is a lively, rock'n'roll upbeat ballad, while "Anna (Go To Him)" has John Lennon on lead for the first time on album, expressing his soon to be familiar relationship problems. "Chains" has George Harrison on lead vocals on Goffin/King's country-ish rocker. For something from 1963, the sound quality on this is impressive. Even on this first album, there was a "Ringo song" and he takes vocal duties on the quirky rock'n'roll of "Boys". It still has a naive appeal to it. "Ask Me Why" is a melodic, lovelorn song from the already melancholic Lennon. It has a catchy but sad refrain. He was setting his stall out early on this type of song. "Love Me Do" was, of course, the group's big breakthrough hit single. I have actually never been a big fan of it, to be honest, finding it lyrically banal, but I have to give credit to the harmonica intro. McCartney's "PS I Love You" is very much early sixties fare, similar to the sort of stuff Elvis was putting out at the same time. Their cover of The Shirelles' "Baby It's You" is very fetching with a convincing Buddy Holly-esque vocal from Lennon. "Do You Want To Know A Secret" is sung by Harrison and was a hit for Billy J. Kramer & Dakotas. It has a sublime, deep, warm bass line. "A Taste Of Honey", I have to say, sounds extremely dated now. It has an atmosphere to it though. The harmonica introduces the energetic, enthusiastic "There's A Place". As appealing as it is, it all sounds so very long ago now. The album ends with Lennon's throaty, suffering from a heavy cold, vocal on the infectious "Twist And Shout" when The Beatles make The Top Notes/The Isley Brothers' song their own. As with all the early Beatles albums, the 2009 stereo remasters are great but you simply can't beat the speaker-shaking thump of the mono version. Just check out that bass on "I Saw Her Standing There" in mono.